(NOTE*** Please read through this whole posting. This isn't one of those posts where you can just go to the config and get the answer right away. Thanks.) Also, this was a two man team effort. Thanks Chris. See the below topology. Because the clusters by default have the same MAC address for the virtual IP address, and because the two clusters are in parallel with each other, you have to change one of the cluster MAC addresses so that they are not the same. If you do not, then the upstream router will wig out and cause you all kinds of instability issues. Think about how ARP works, then think about if you had two MAC addresses that were the same on the network. You can see that that's a big no no. [Expert@CPfirewall1]# cphaconf set_ccp broadcast <---- You can change this mode, but multicast is the default and recommended. [Expert@CPfirewall1]# cphaconf set_ccp multicast <---- Multicast is the default, you prefer this. Expert@CPfirewall1]# CPfirewall ctl get int CPfirewallha_mac_magic <---- This command tells you what the value is set to for "CPfirewall ctl set int CPfirewallha_mac_magic"
[Expert@CPfirewall1]# CPfirewall ctl get int CPfirewallha_mac_forward_magic <---- This command tells you what the value is set to for "CPfirewall ctl set int CPfirewallha_mac_forward_magic"
For (CCP traffic): "fwha_mac_magic=0xfe" OR "CPfirewall ctl set int CPfirewallha_mac_magic 254"
For (Forwarding Layer traffic): "fwha_mac_forward_magic=0xfd" OR "CPfirewall ctl set int CPfirewallha_mac_forward_magic 253"
Now, one question I have had is this: Are the above commands the same? Meaning, do "fwha_mac_magic=0xfe" OR "CPfirewall ctl set int CPfirewallha_mac_magic 254" mean the same thing? It does appear that they are. So I think I can conclude also that these two are the same as well: "fwha_mac_forward_magic=0xfd" OR "CPfirewall ctl set int CPfirewallha_mac_forward_magic 253"
So from what I can find, these two for each set should be the same. Especially after what we read next. We do not recognize the second parameter, if you think it is relevant please let me know where you took it from. The Cluster Control Protocol (CCP) packets that are sent between the members of the same cluster reach the neighbor cluster (connected to the same network) and "confuse" it. The "confusion" rises from the fact that CCP packets in Check Point clusters have the same Source MAC address - 00:00:00:00:mac_magic:member_id (where - mac_magic (5th field) designates the type of CCP packet, and member_id (6th field) designates the Member ID). The 5th field of Source MAC Address - mac_magic - has to be unique for each cluster. Ok, so make matters a little more confusing, here is another sk about this same issue. Its sk25977. See below the cut and paste for that sk. By the way, didnt that TAC engineer say in their email to me that they didnt recognize the commands in sk36913 (above)??? 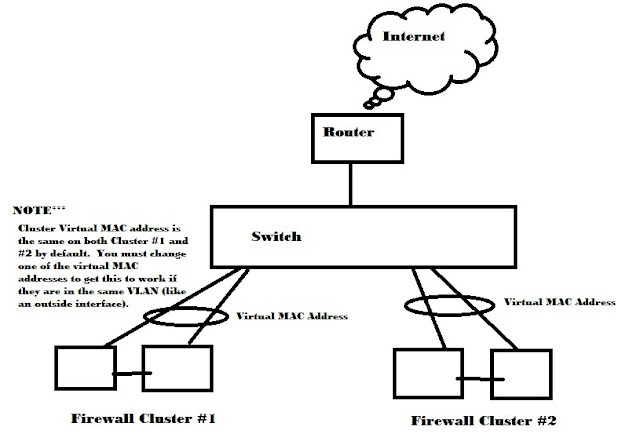 It is not recommended to connect interfaces of multiple clusters to the same network segment (same VLAN, same switch). A separate VLAN and/or switch is recommended for each cluster. A crossover link may be used for the sync (secured) interfaces. The "Source MAC address" of the Cluster Control Protocol, to enable communication between cluster members. (For all ClusterXL modes, both High Availability and Load Sharing). The "Destination MAC address", to enable communication between the cluster and machines outside the cluster. (For ClusterXL Load Sharing Multicast Mode clusters only). Cluster members communicate with each other using the Cluster Control Protocol (CCP). CCP packets are distinguished from ordinary network traffic by giving CCP packets a unique Source MAC address. The 6th byte is the ID of the sending cluster member. When more than one cluster is connected to the same VLAN, if CCP and forwarding layer traffic uses multicast, this traffic reaches only the intended cluster. If CCP and forwarding layer traffic (and in certain other cases) use broadcast, cluster traffic intended for one cluster is seen by all connected clusters, and is processed by the wrong cluster, which causes communication problems. These parameters apply to both ClusterXL and OPSEC certified clustering products. Changing the values of these module configuration parameters alters the fifth part of the source MAC address of Cluster Control Protocol and forwarded packets. Use any value as long as the two module configuration parameters are different. To avoid confusion, do not use the value 0x00 or 0xFF. When Performance Pack is used to enhance the performance of ClusterXL Load Sharing Multicast Mode, it is recommended that the chosen numbers be consecutive, with the lower one being even (e.g., 0x10 and 0x11, or 0xBE and 0xBF, in the example above 'a' and 'b'). To be performed on each cluster member that is connected to the same network segment. Very important: when editing multiple clusters, please make sure that values are different (values should be same for 2 members of one cluster), for example 'fe' and 'fd' for same cluster members, but for different cluster it would be i.e., 'ba' and 'bb' values. In the ClusterXL page of the cluster object, select Load Sharing Multicast Mode. In the 'Topology' tab, edit the cluster interface that is connected to same network segment as other cluster(s). In the 'Interface Properties' window - 'General' tab - click 'Advanced'. Change the default MAC address, and carefully type the new user-defined MAC address. It must be of the form 01:00:5e:xy:yy:yy, where X is between 0 and 7, and Y is between 0 and F (Hex). Install the Security Policy onto the cluster. OK, FINAL CONCLUSION: I sent an email to a couple of technical engineers at Check Point that I know. I point blank asked them which one is it that is accurate. One engineer said this, among other things: "I think what the TAC sent you in the included email is probably as good as anything to follow since it includes the method for making it a permanent change." I trust the engineer enough to go with what he says. Now, just one more confusing note in case you see it. In sk26202, it says the following to make the change permanent. It was referenced in sk36913 (above). I tried this below, it didnt work for me. Global kernel parameters exist to control (customize) the behavior of Security Gateway (kernel parameters are located in $FWDIR/boot/modules/fw*mod* kernel modules). This control (customization) can be done on-the-fly using the fw ctl set int command (change takes effect immediately). However, the value of the kernel parameter returns to its default value after a reboot. At times, it may be required to control (customize) the behavior of Security Gateway permanently. In addition, it is necessary for some kernel parameters to be changed upon boot. Setting kernel global parameters on-the-fly is the same on all OS's using the fw ctl set int command. Warning: applies to Security Gateways ONLY. Note: Verify the existence of the kernel parameter first using fw ctl get int command. Setting kernel global parameters permanently is unique for some OS's. Note: Verify the existance of the kernel parameter parameter first using fw ctl get int command. Note: For SecureXL global kernel parameters (located in $PPKDIR/boot/modules/sim*mod* kernel modules) refer to sk43387. ***SOLUTION UPDATE:  I did what the TAC engineer said to do in the email above, with exception of one thing. I put in the HEX number instead of the DECIMAL number. What I did worked, and it now shows up correctly in the ARP table of my Cisco switch. Below, in yellow, is what I changed on my second cluster. In orange, is the default original cluster.